The Edinburgh Suburban line was the Victorian equivalent of today’s ring road, deigned and built to relieve congestion on an overburdened yet sill developing urban transport network. Starting life as a legally independent company, its prime function was to provide a through route for freight around the capital, passenger potential being negligible, but the city was slowly expanding in its direction. A passenger service was introduced shortly after opening, the number and location of stations being defined by assessed viability. 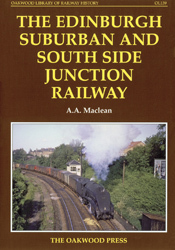 As the city expanded, the stations became surrounded by domestic, commercial and industrial buildings and became centres of their respective communities. As ‘town offices’ for the NBR, they functioned as ‘rail shops’ between trains, revenue and statistics being perhaps artificially inflated by bookings from Waverley with no suburban railway element. Passengers on return portions of tickets were also discounted! Early local freight was buoyant and diverse but mainly cattle, agricultural, or from collieries. Brewery sidings came later. The decline of these basic industries after the First World War and the advent of the ubiquitous electric tramcar seriously affected local revenue – freight and coaching. Unfettered road competition grew after 1919, and although passenger traffic declined, the line survived several withdrawal threats until production of inadequate statistical interpretations led Edinburgh councillors to sign its death warrant in 1962 shortly before Dr Beeching’s report was published. Since then, apart from blaming Dr Beecham – who was not involved – there have been several clamours for reinstatement, but population shifts and the city’s southern expansion makes this unlikely – at least as most of the former statioin locations have no car parking sites nearby! The ‘sub’, having faced challenges which it has met and adapted to over the years, is now reduced to almost ‘plain line’ but continues to function in the capacity for which it was intended 125 years ago – a city bypass. A5 format, 320 pages, 228 illustrations.